Tales from the Real OC (Really! ): DREAMLAND In Stores Now!!!! I'm so excited to announce that book #3 in the RILEY BLOOM series, DREAMLAND, is now in stores!! 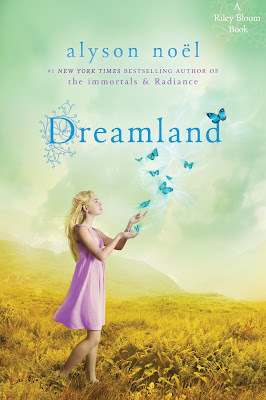 As I've said before, Riley is one of my favorite characters to write, and DREAMLAND was no exception! In it, Riley's finding that the afterlife can be a lonely place when all you do is focus on work. So she goes to the place where dreams happen, hoping to find a way to contact her sister, Ever. She meets the director, who tells her about the two ways to send dreams. As a Dream Jumper, a person can jump into a dreamer's dream, share a message, and participate. As a Dreamweaver, an entire dream can be created in a studio and sent to the dreamer. But Dreamweaving was outlawed decades ago, and the studio was boarded up. Thinking it's her only way to reach out to her sister, Riley goes in search of the old studio. There she finds a ghost boy, who's been creating and sending nightmares to people for years. In order to stop him and reach out to Ever, Riley is going to have to confront and overcome her own fears. I hope you enjoy Riley's adventures as much as I enjoyed writing them!! The trailer is below--enjoy!! Yes! so excited to read it! is it true that both this and the immortals series will be made into movies? Thanks so much, Victoria! I appreciate your support! I can not wait to be published in Brazil! Alyson I love your books! Thanks so much for your support, Vera--I really appreciate it!